USA Portion sizes - Gym Training App by Weightplan.com - Gym Training Personal Trainer App - Free Diet & Exercise Tracker, Personal Trainer, workout plans, build muscle, gain fitness and burn calories. ​Portion control is essential to making sure that we are all getting the correct quantity and balance of nutrients. As people eat more foods outside the home, being aware of portion sizes has become essential to weight management and overall health. 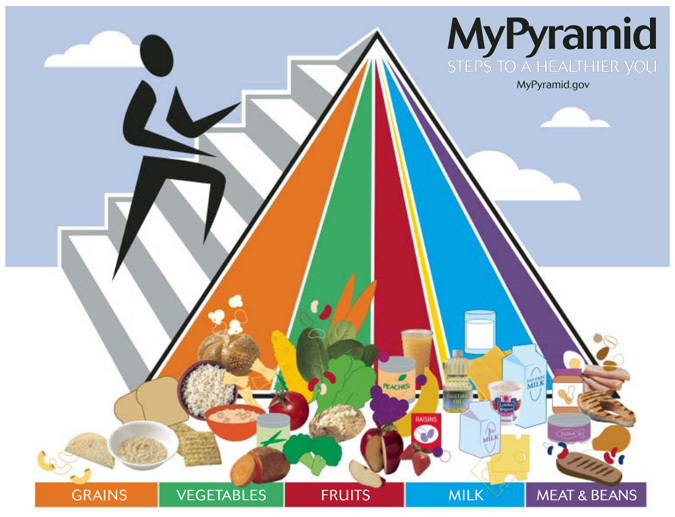 The MyPyramid is a handy visual tool to show you ideally how your day’s food intake should be made up of the 6 food groups. Remember that the recommended amounts need to be tailored to your age and whether you are male or female, and will be smaller for children and larger for people who are very active. These starchy foods include bread, pasta and breakfast cereal. They should make up the basis of your main meals. Try to eat 5 to 6 ounce equivalents for women and 6 to 8 for men from this group each day, and aim for half of the grain foods you eat to be whole grains.. The recommended intake of vegetables is 2 to 2½ cups for women and 2½ to 3 cups for men per day. Try to include a mix of dark green, orange and starchy vegetables as well as dry beans and peas and other vegetables. Women should aim for 1½ to 2 cups of fruit a day and men for 2 cups a day. It’s best to enjoy a variety of different types. To make sure that you are having adequate calcium from your diet, aim for 3 cups from the milk group per day. These include foods made from meat, poultry, fish, dry beans or peas, eggs, nuts, and seeds. To ensure that you are getting adequate protein from your diet, men should make sure to have 5½ to 6½ ounce equivalents from this food group per day whereas women should aim for 5 to 5½. Oils are fats that we add to food when cooking or eating it, such as olive and canola oil. This allowance is only for liquid oils, rather than solid ones such as butter, because liquid ones tend to be better for our health. However all oils, and foods high in oil such as mayonnaise, are very high in calories. Try to limit oils to 5-6 teaspoons a day for women and 6-7 teaspoons a day for men. This is a calorie allowance set aside for foods high in fat and sugar, such as butter, candy, soda and alcohol. Try to limit these in your diet; they contain a lot of calories and often little other nutritional value. They should only make up a very small proportion of your daily intake, 130 to 265 calories for women and 265 to 360 for men. Try to serve out an ideal-size meal onto your plate – if you have cooked too much you can refrigerate the leftovers for another meal. Don’t be tempted to fill up your plate too much, and if eating out don’t feel obliged to finish everything you are served. Choose medium-size plates rather than very large ones, and give children their own smaller plates. If you feel very hungry add more vegetables or fruit to the meal to help fill you up.